Everyone has a story to tell and there is a writer within all of us. This was obvious at the recent writers’ workshops held in Port Moresby and conducted by Library For All. Simon Ellis, our Country Program Manager for PNG, shares his experiences. In a country as diverse as PNG, with a rich oral storytelling tradition, there is a wealth of material. From the highlands to the coast, from the cities to the rural areas, from past to present – and indeed to explore hopes for the future – stories are used to entertain, educate, inform and inspire. The task at our LFA writers’ workshops is to recognise the natural talent that is there and help channel it towards the written word. Participants at the October workshops were officers from World Vision and ChildFund who had volunteered to spend a couple of days working with Library For All to begin building a collection of local stories to populate LFA’s digital library platform. The workshops began by identifying elements of a story appropriate for the reading audience in mind – in this case elementary students. We looked at the curriculum at this level, sample picture books, and started brainstorming people and places, animals and creatures that populate the PNG environment. From this beginning, the writers started to breathe life into these places and characters by describing them in detail and thinking of storylines that could accompany them. Most participants had expressed early concerns that they were not “professional” writers. Soon the animated conversations and industrious atmosphere told its own story of how individuals who are given the opportunity to express themselves in a supportive environment can reach into their own experience and come up with some wonderful pieces. Some stories made us laugh, others made us think. Feedback from the group helped improve the emerging tales as the writers crafted their works into relevant material for young people. Although of different lengths and topics, each story had a flavour that is unique to PNG. 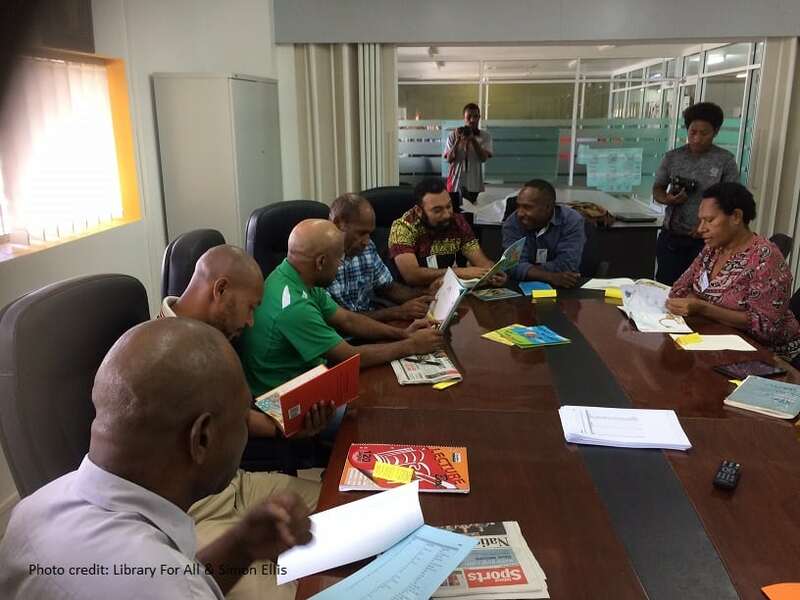 Of course, the idea behind this approach is to make reading material relevant and identifiable to young readers in PNG. It is a motivator for the very young to recognise their own environment and stories in the tales and, through this motivation, to actively engage with words and seek to gain meaning from them. It also proved a motivator for the not-so-young to have the opportunity to express themselves as tale after tale came forth! Some participants working in areas such as Health, Community Development and Agriculture used the time to write words that shared messages with readers on important issues in line with their work. The final session at both workshops was spent sharing each writer’s favourite story and then agreeing on 5 favourites for the group. This was not easy as every participant, without exception, had something worthwhile to present. The voting was very close! We came away from the workshops with over 100 stories to process further – a great start to the library and a credit to all involved. Hi there, my name is Ugi and I am an ant. I am small. I have many feet. I dig with my feet. I live by the river, away from the city. I walk many miles to look for food. I may be small, but I am strong. I carry my food, all the way home. My name is Ugi and I am an ant.